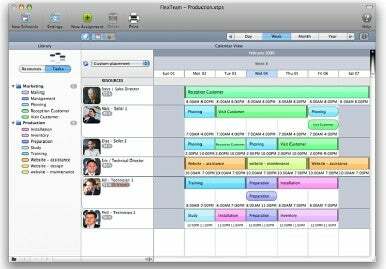 App4mac on Thursday announced the release of FlexTeam 2.1, a new version of its scheduling application for Mac OS X. It costs €29 (US$39). FlexTeam helps groups manage their schedules together. FlexTeam is intended as groupware — it’s aimed at a group of users in an organization or company that want to share information, work jointly on schedules, and use shared resources. You can use FlexTeam to check daily working schedules, manage days off for each person and track holidays. FlexTeam lets you show your schedule in different formats (day, week, month or year) and you can print your views, generate PDF files or publish a schedule on a Web site. New to the 2.1 release is a new search function integrated in the toolbar, new “Tasks to assign” window, performance improvements, an updated user interface, updated documentation, and bugs fixed. FlexTeam requires Mac OS X 10.5 or later.